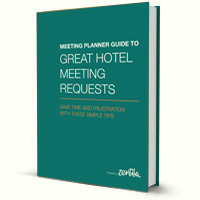 A little flexibility can help save money on your meetings. Last week, I told you the one sentence you should never, ever put in your meeting request. This week we’re going to continue flexing with a unique idea that could have a dramatic impact on your bottom line, after you’ve signed the contract. Hotels are constantly working to complete their “occupancy puzzle.” After they’ve booked your meeting, they’re out to find other business that will neatly fit on top of, at the back end of, or before your meeting, on their quest to maximize their occupancy and profitability. But as we know, most things in life aren’t so “neat,” and finding that perfect-fitting group is all but impossible. That’s when this phone call is made. Henry clearly has a vested interest in your saying yes, and he’ll often tie the request to some type of incentive for doing so. If it’s not a problem and you’re able to be flexible, then bam! The hotel gets to book another group, you get the concessions, and there’s big love in the air for you and your meeting. In many cases, such flexibility costs you very little (or nothing at all), while giving you additional perks and the gratitude of the whole hotel sales office. Most groups have some level of flexibility in their program, especially if there’s enough time to react. And I’ve foundall groups have a need to save money while delivering more to their attendees. So why not control this process and ensure you get the first shot at any offers for flexibility? As soon as your contract is signed with the hotel, send the sales manager and your conference service manager a quick note asking them to identify your group in their system as the first group to call if they need a group to be flexible. Why is this important? First off, you really set the tone for the relationship by offering to help up-front. Second, you’re not saying you will be flexible – just that you want the first option to say yes or no. It’s a no-lose offer for both sides. So, bending a little at the right time doesn’t hurt if you’ve practiced being flexible. And meeting planners who practice flexibility often find that hotels will “bend over backward” in times of need.